Did you make any specific resolutions this New Year? How about set any specific goals for yourself? That seems to be a pretty standard tradition when the new calendar rolls around. And it’s not all that bad an idea either. The problem, at least for me, is sticking to those goals. Especially when it comes to my diet, and my ability to cook wholesome meals for the family that we’ll all love (and actually want to eat). I’ve heard and read about alllllllll the fads, the trends, the diets that ‘work’. Well, none of them have ever, successfully, worked for me- at least not in the long run. What I have discovered that does work for me? Adapting some of my favorite comfort foods into a healthier form. That way I can still satisfy those cravings, get the same flavors, but without a lot of the negatives. Mostly fried bits and those darned carbs. Ain’t gonna lie y’all- I’m not a ‘sweets’ person at all. Bread, pasta and all that is more my ‘thang’. And I could not (happily) live without them for long. A good recipe for Chicken & Waffles is a standard Southern staple. Each varies degrees by family, but they all have the same idea at heart- and they’re all smothered in a generous drizzle of maple syrup. It’s also something I couldn’t live without. 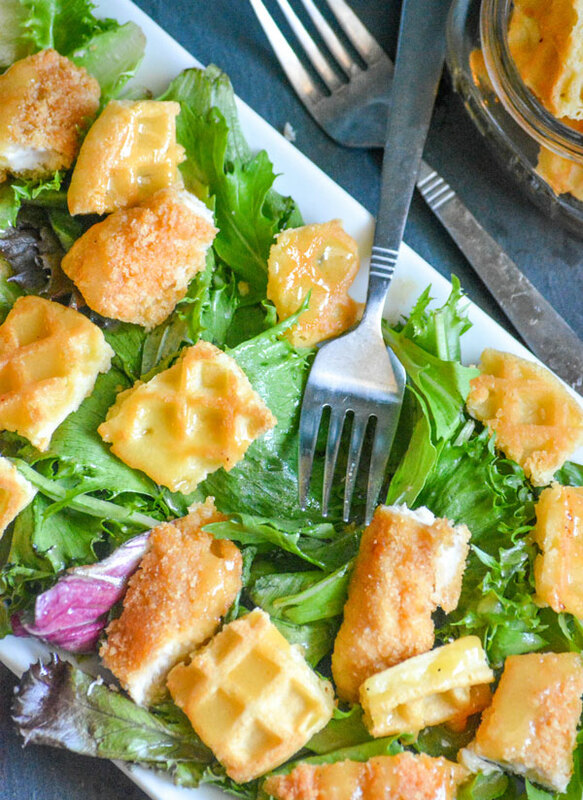 Thankfully, with this new idea for Chicken & Waffle Salad with Maple Dijon Vinaigrette, I’ll never have to. Seriously, I can’t even imagine that life. It wasn’t that long ago though that I wouldn’t have been able to imagine adding ‘greens’ to my beloved chicken & waffles either. It wasn’t a healthy dish. That word wouldn’t have touched it with a 10 foot pole! Still, one’s got to get with the times. So get with them we did. Taking out the fried bits, and adding a bed of leafy greens. 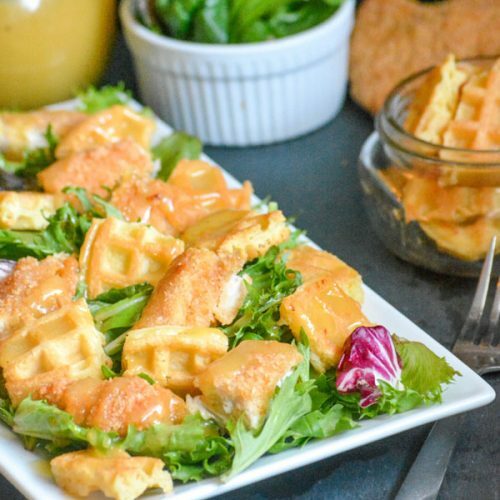 Chicken & Waffle Salad with Maple Dijon Vinaigrette delivers all the flavors you need and love, without the oils, trans fats, and a quarter of the carbs. Quick & easy, this meal can be ready in a flash- making a great lunch or dinner. 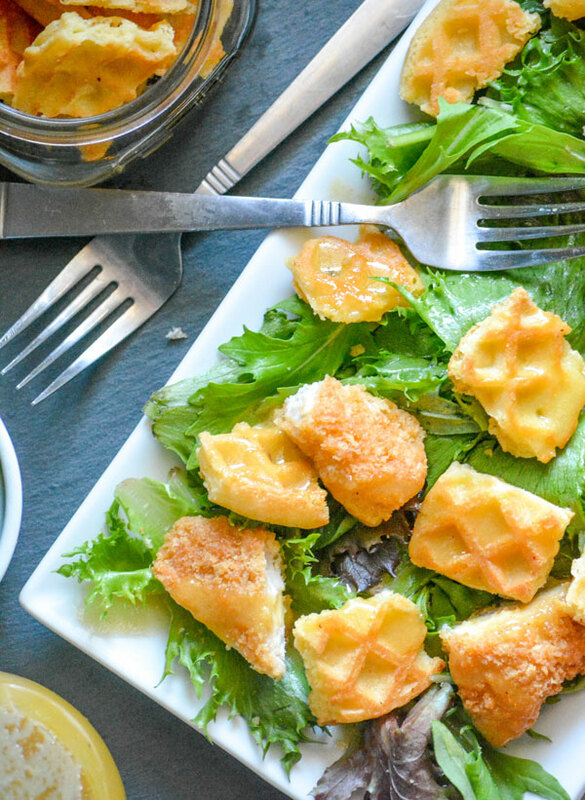 Chicken & Waffle Salad with Maple Dijon Vinaigrette features tender chunks of ‘fried’ chicken (actually baked) & crisp waffle ‘croutons’ over a bed of mixed spring greens, topped off with a heavenly drizzle of an absolutely divine maple dijon vinaigrette. 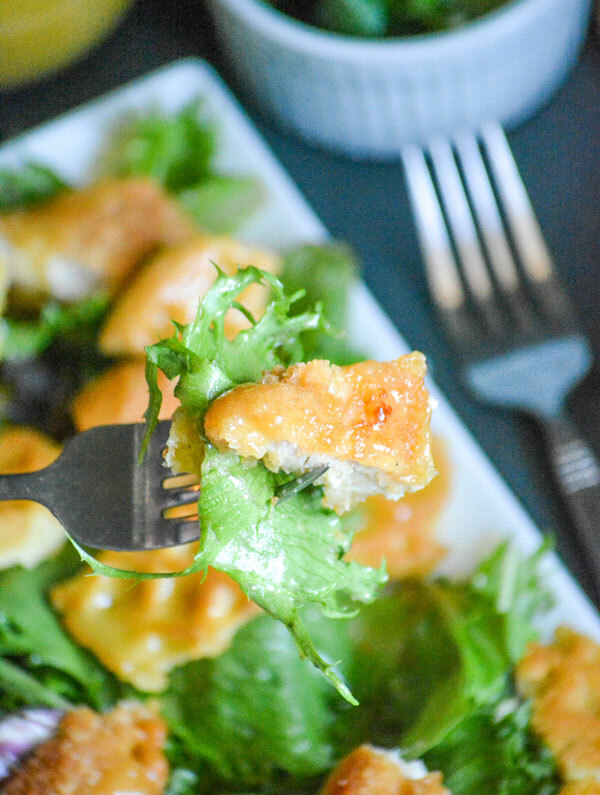 A salad of crisp spring greens topped with healthier choices that reminds you of one of your favorite Southern comfort foods. Using sharp kitchen shears, cut your waffles into bite-sized pieces. Spread them out onto a baking sheet. Drizzle them with the melted butter & toss to coat. Spread out again and bake at 350 degrees, for 7-10 minutes, until toasted and golden brown. In a large bowl, add all of the ingredients. Using a whisk, whip all of the ingredients together until they're evenly incorporated. On a serving platter, or in a large bowl, make a bed of greens. 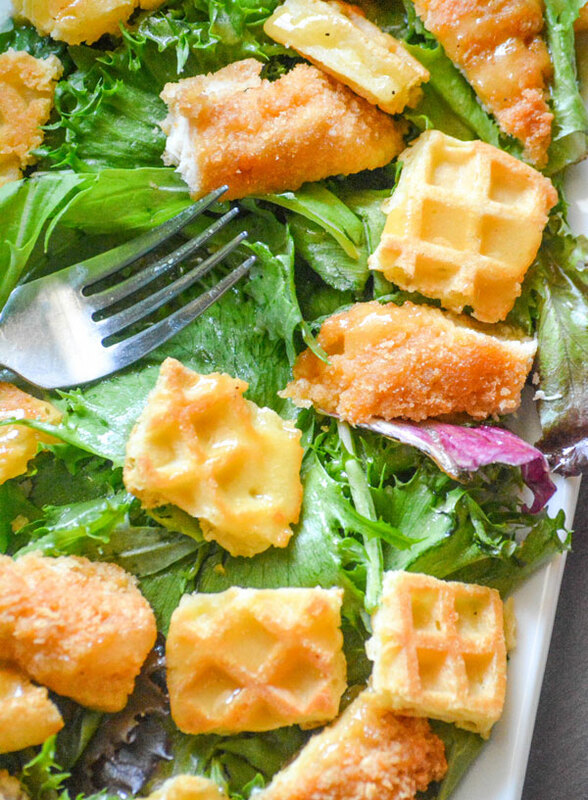 Add the chicken pieces and waffle croutons to it. Drizzle with the vinaigrette. Toss, if desired, to evenly coat. 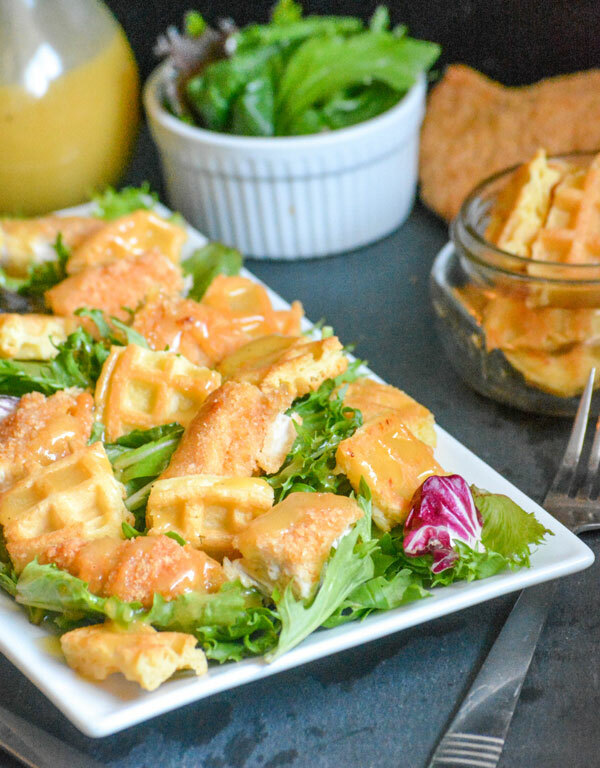 Chicken & waffles in a salad? Well somehow you’ve made it work with that Maple Honey Dijon! So clever! 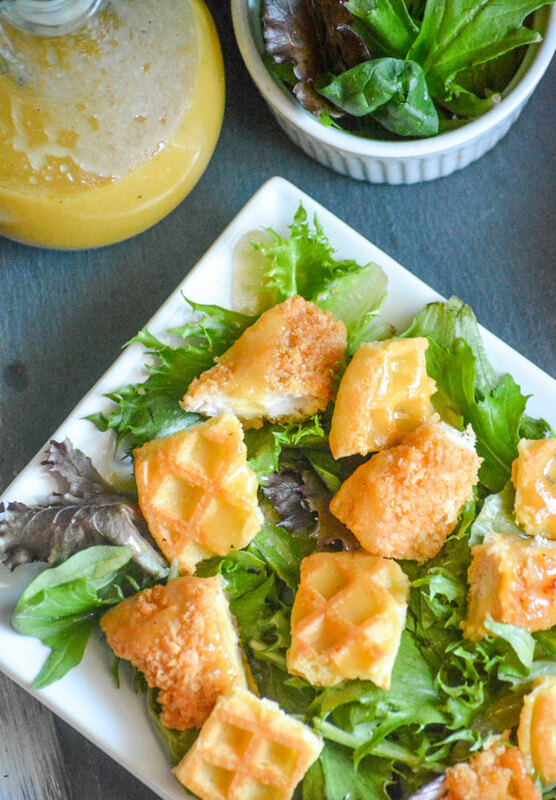 Waffle crutons and baked chicken salad? What is there not to love! Thank you for sharing at Fiesta Friday! I love this idea, chicken and waffles are great together, I’ve seen several versions of this posted all over the net, your’s looks amazing! There are so many similar versions out there, and when you live in the south you see a million renditions of this, but I love the way you adapted the recipe and your presentation is awesome!